Overly long nails on your pet can actually result in health issues, such as infection and an irregular gait. This is a guide about helping a dog with long nails. Question: Can Nails That are Too Long Cause a Dog to Limp? If my dog's nails are too long will it cause her to limp? Yes, if they grow long enough to touch the pads of her paws. Long nails can also catch on things like the carpet and cause damage to the paw, so it is best to keep their nails trimmed. If you do not know how to cut his nails, it is best to have it done professionally because if you cut too far down, he could end up with severe bleeding. Most definitely! Please have this taken care of a.s.a.p.! Your vet can start the process - if you don't feel competent enough to do them yourself, always have the vet (or your groomer) take care of them. How would we feel if we didn't take care of our nails? As was already mentioned, dogs nails can catch on many things and break. Having a break above the nail bed isn't something that you'd want to have happen. Please take care of your little one very soon. What does the vet do when you take your dog in because his toenails are way too long and he is limping? 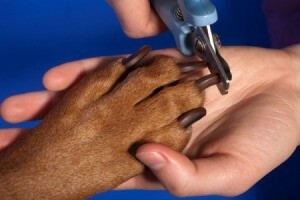 Your Vet will trim his nails with a nail clipper. Nail clippers are not expensive and I'm sure the Vet would show you how to do it yourself.